Use a mixer to combine the Greek yogurt, sugar, butter, applesauce, eggs, lemon juice, and vanilla extract. Add in the flour, baking powder, and 1 cup strawberries; and mix well. 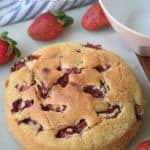 Pour almost all the batter into the baking dish, top with the remaining strawberries and cover with the remaining batter. Place in the oven for 50 minutes or until done. Tips: Try adding other berries such as raspberries and blueberries.